Believe it or not, there are people who pay for vintage advertisements like these. eBay is chock full of auctions for original pages from the old magazines that contain ads for products and services. Often, if you know where to look, you can buy the entire magazine in which a particular ad appeared for only a little more. People sometimes frame them and either hang them for decoration or present them to a parent or grandparent as a memorial to their lives. Stranger things are done. 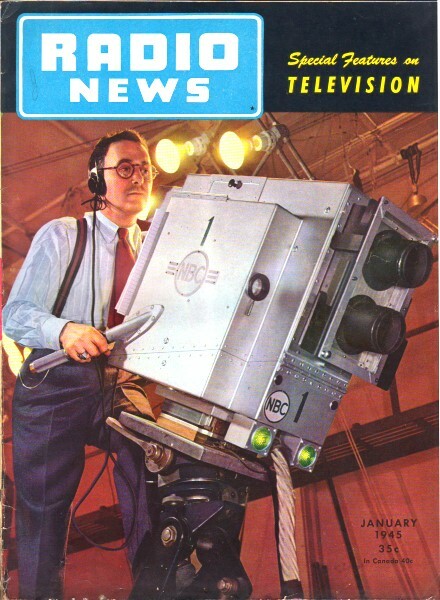 This ad for Detrola Radio appeared in the January 1945 edition of Radio News. Detrola, as the name suggests, the company was located in Detroit, Michigan. 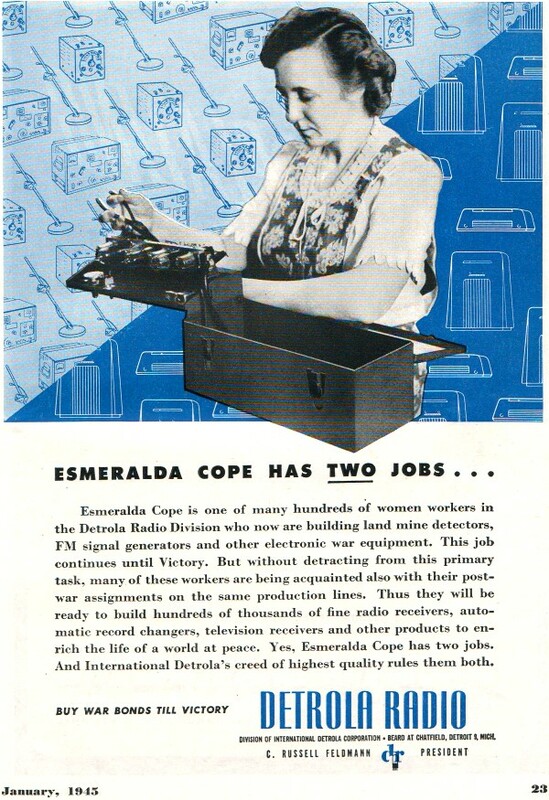 Esmeralda Cope is one of many hundreds of women workers in the Detrola Radio Division who now are building land mine detectors, FM signal generators and other electronic war equipment. This job continues until Victory. But without detracting from this primary task, many of these workers are being acquainted also with their post-war assignments on the same production lines. Thus they will be ready to build hundreds of thousands of fine radio receivers, automatic record changers, television receivers and other products to enrich the life of a world at peace. 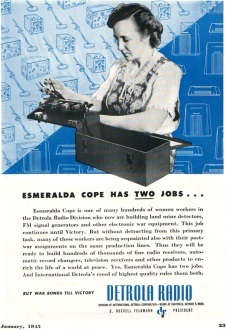 Yes, Esmeralda Cope has two jobs. And International Detrolas creed of highest quality rules them both. Division of International Detrola Corporation • Beard at Chatfield, Detroit 9, Mich.